Almost six years have passed since I last posted on The Sandbox. I was fortunate to be among the first contributors to the site, and it was my blogging that helped me keep my sanity during a year-long deployment to Afghanistan. My blog, Afghanistan Without a Clue (AWAC) has been deleted, and I have retired from the Air Force, attended seminary under the GI Bill, and am now the minister of the Unitarian Universalist Church of Tullahoma. I’ve used stories of my days in Afghanistan in numerous sermons, and I am often asked my views on the war, which is amazingly still going on. I am far from an objective observer. Not only did I spend a year of my life in Afghanistan, but I sent my two sons off to fight in the same war. My older son, Taylor, is in the Army, and my younger son, Ryan, is a Marine. They were both in harm’s way more often than I was, and my wife and I had the horrible agony of waiting for deployments to end and our sons’ safe return. So what do I think about the war? Well, as villains go, you can’t really come up with anyone more farcically evil than the Taliban. If you were to write a novel, or make a movie with them as the villains, you would be told to go back and make them more believable. After all, they blew up schools and killed teachers who dared educate little girls. They outlawed fun (no, really -- they banned kite-flying, many forms of clothing, music; pretty much any expression of joy). Their thugs walked the streets beating people for the slightest violation of their standards. They destroyed ancient statues of the Buddha. They executed people as half-time entertainment at soccer games. The Afghanistan Without A Clue crew: Drew Morton, Doug Templeton, Mike Toomer, me. If they had the technology and the military power of the Nazis, they would have set the new gold standard for universally recognized evil. No one in their right mind would want to be one or live under their rule, or so you would think. And yet they still exist, and they recruit new members, which either says something about our foreign policy, or about humanity’s willingness to submit to thugs. But if all the years we have spent in Afghanistan have not succeeded in reducing the Taliban to irrelevancy, I’d be hard-pressed to call it worthwhile. Perhaps we went about it all wrong. But that’s for the "experts” to hash out. I’d like to say my final goodbye to The Sandbox and its readers by sharing two stories. They tell of personal marks the war has left on me, one good, one sobering. Countless numbers of people have been changed by the war. At least in my case, I came out okay on the other end. Far too many others have not. And the sense of betrayal and distrust I feel for our nation’s leadership will never leave me. 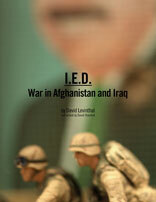 The first story begins when my youngest son, Ryan, was deployed to Afghanistan. As a Grunt, he would be in harm’s way a great deal, or so I assumed. We were able to maintain regular contact via the internet, so we could know pretty much day-to-day that he was still alive. One day, I read that several Marines had been killed in the south, which is where Ryan was. It was also at that time we lost contact with him, not hearing a word for over two days. I was beginning to get worried, as you might imagine. On the second day, I heard a car drive into our driveway, and a door open and close. This almost never happens where we live. We just don’t get unexpected visitors. I was sure it was a military chaplain coming to tell us that Ryan was dead. The certainty was absolute. I hurried to the door and opened it, only to find a man from the utility company had pulled into our driveway to read a meter. Ryan told me later that when the Marines had been killed, all outside communications was cut off until the families had been notified. Then I remembered that this same thing happened to us whenever anyone from Camp Phoenix had been killed. I had totally forgotten about this. Not only did I have a brief moment of mistaken certainty about my son’s death, I once had an entire day of certainty about my own impending death. It occurred on September 10th, 2006. At this point our deployment was still in its early stages, and Kabul was relatively safe. We traveled around in unarmored Toyota SUVs, and weren’t required to wear helmets or report our travels to anyone. Each day we traveled to local Afghan bases and worked with Afghan soldiers during the day, then traveled back to Camp Phoenix for the night. If there was any indication of heightened threat, we were told to stay at Camp Phoenix for the day. On the afternoon of September 10th, I arrived back at my hut to find one of my hut mates quite irate. He informed me that even though there was intel suggesting attacks would occur on Sept 11th (to celebrate the anniversary of the 9/11 attacks), we would still have to go out. People were, to put it mildly, concerned. Some were writing “death letters” -- the final letter to be mailed home by a friend should you die. It was pretty grim. At this point I became convinced that I would die the next day. It was not logical, but it was a fact, at least in my mind. I had to decide how I would spend my last hours on earth. I did not write a death letter, nor did I call my wife and say my final goodbyes. I had enough sense to avoid that. If death came, it came. I was not going to spend my last evening writing a letter. I’ve actually written and given, on numerous occasions, a sermon about this event. I call it Yes, There are Atheists in Foxholes. I had once been a very conservative, fundamentalist Christian, but was now an atheist, and my atheistic convictions were about to be put to the test. Would I return to my former belief in God, praying for protection, or would I remain firm in my belief that life was random, and if I died, no damnation awaited? I remember taking a walk that evening out on the running track that surrounded our helicopter landing/sports area (in reality a large flat expanse of hardened dirt and rock). I pondered the meaning of life, and wondered what it would feel like to die. Yet through it all, I remained firm in my convictions. I returned to my hut not to pray and repent, but to finish up an anime series I was watching on DVD. Might as well, since I’d be dead the next day. Thankfully, I was wrong. The next day, though full of stress, passed uneventfully, and when we pulled in to Camp Phoenix, we all let out a huge sigh of relief. We had made it. Those death letters would not have to be mailed. I could order some more anime. Life would go on. My sons: Taylor and Ryan. This event, inadequately described in a few paragraphs, was hugely transformational in my life. It showed me that convictions firmly held, arrived at through careful consideration, could survive the trauma of war and the certainty of death. After returning home, I discovered the Unitarian Universalist Church in our town, and learned that they welcomed atheists and agnostics, not only as members, but as ministers. So not only are there atheists in foxholes, there are atheists in pulpits too. But that’s another story for a different forum. So that’s it, my final post. 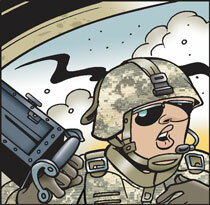 I’m glad I could share my stories with you, and I’m delighted to have been associated in some small way with the Doonesbury comic strip, which I started reading at age 13, and have loved ever since. 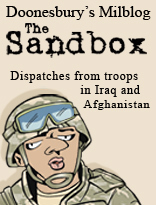 Many thanks to Garry Trudeau, David Stanford, and the rest of the gang at The Sandbox for getting our stories out. Doug Traversa's 30-some Sandbox contributions include Mongolian Jam Session, Han's History Lesson, The Most Colorful Things in Afghanistan, and The Great Wall. He often wrote about conversations with his translator, as in these posts: Hamid, and Bear, Hamid, Mike and Drew Ponder the Universe. Thank you for posting. I'm still adjusting to the fact that soon I won't have Sandbox. I hope your sons both finish their service safely. Doug, thanks for this excellent post. I wish nothing but health and life for you and your two fine sons.